Download Finding Dory in Digital HD from the iTunes store. Finding Dory images are © Walt Disney Pictures. All Rights Reserved. In 2003, a little fish named Nemo (Hayden Rolence; Cicero in Winter) mesmerized the world. With his bad fin, overbearing father and adventurous spirit, he captivated us into wishing him home. Along for that journey was his father, Marlin (Albert Brooks; Broadcast News) and a forgetful fish named Dory (Ellen DeGeneres; The Ellen DeGeneres Show). Thirteen years later, it's Dory's turn to grab our hearts in Disney/Pixar's Finding Dory. Marlin, Dory and Nemo are happy living in the vast ocean near the drop off. Dory becomes upset, though, when a class trip to the sting ray breeding ground reminds her of her parents and her home that she had forgotten about. She suddenly starts having flash backs and begins to remember things about her past. She convinces Marlin and Nemo to head with her to California to try and find her family. Once she hits the aquarium in California, she get separated from Marlin and Nemo and must try to navigate her way through the labyrinth of exhibits by herself (almost) to figure out where she came from and where her parents might be. Along the way, she enlists the help of Hank the Octopus (Ed O'Neill; Married with Children), and the whales, Destiny (Kaitlin Olson; It's Always Sunny in Philadelphia) and Bailey (Ty Burrell; Modern Family). Eventually, she is reunited with her parents, and Marlin and Nemo, as she learns new ways to remember things. Animation has become so amazing in the last 10 years that the audience expects a certain quality in these feature films. Finding Dory certainly doesn't disappoint with an attention to detail that is fantastic. Each piece of kelp, or a sea lion, is painstakingly created, which helps immerse the viewer into the underwater world. The 3D aspects are also excellent and utilized at optimal times in the film. The story is cute, if not familiar. Even Marlin notes at one point, "Not again", as Dory gets "taken" and they must set out to rescue her. The new characters blend beautifully with the ones from the first film and add some humor to the plot. Interestingly, I don't feel Finding Dory works terribly well as a stand-alone movie. The audience needs the nostalgia and familiarity of Finding Nemo to carry us through to the end of this sequel. The cast is terrific and plays these sea life creatures beautifully. DeGeneres reminds us why we fell in love with Dory in the first place and Brooks is still his neurotic clown fish persona from the first film. The additions of O'Neill, Burrel, Olson, Diane Keaton (The Family Stone) and Eugene Levy (Bet in Show), as Dory's parents, blend with the original members so well that the transition is seamless. Sloane Murray is adorable as the voice of young Dory and she nails the vocal mannerisms of DeGeneres perfectly. 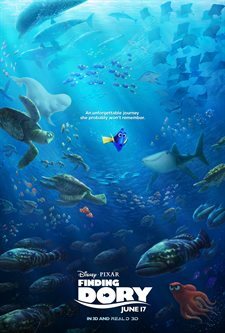 Finding Dory is obviously one of this summer's animated blockbusters and Disney/Pixar are counting on our love of the original film to draw audiences to the movie. Luckily, the film has the quality to make people want to see it and bring their little ones to marvel at the world under the sea. For anyone who loves Nemo, Marlin and Dory, they won't be disappointed and they must add this film to their summer viewing list. There are enough laughs and cute moments to make Finding Dory enjoyable. 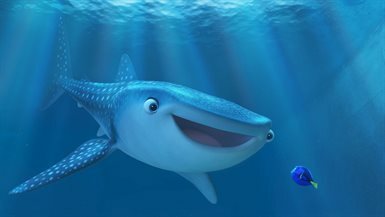 Finding Dory images © Walt Disney Pictures. All Rights Reserved.